Pastor Ron Riffe, of the Cutting Edge section, From A Pastor's Heart, wrote most of the material for this article. We are truly thankful for the insight the Holy Spirit has given him at this very critical time in the history of this world, but then God has always gone outside the normal church leadership, to pass His Word for a particular time, to His people. Please listen carefully, as the Word of the Lord may just be ready to speak to you through this message. However, before we get started, we want to remind our readers that The Cutting Edge Ministries is firmly a Pre-Tribulation Ministry. That is, we firmly believe that the Lord will return for His Church before the beginning of the 7-Year period known as the Tribulation Period. God clearly states that this period will begin when Antichrist will "confirm the covenant" with the leaders of Israel [Daniel 9:27]. Bear this in mind, because too many people have been led to believe that the Tribulation Period will begin when Antichrist arises, definitely not true. As I try to put these thoughts together, I am reminded that the last few days of 1999 are quickly slipping away. In just a month a new year will be upon us. one that many are loudly proclaiming to be the start of a new millennium. to the total consternation of those who rightly point out the old millennium does not end until 2000 is over! But in any case the new year promises to bring with it problems the like of which this world has never seen! If the Y2K computer glitch turns out to be only a fraction as bad as it potentially could be, the result may devastate the economies of the nations of the world and literally force us all back into "the horse and buggy days." Then when we consider the fact that both China and North Korea are "rattling the saber" and threatening war, plus militant Islam continues to make threats against "the great Satan". the United States. our immediate future takes on a very dark hue indeed.! Amazingly enough, against all odds, the overwhelming majority of fundamentalist and/or evangelical Christians continue to maintain a cheery outlook. When pressed about the reason for their optimism, the reply is usually based upon the belief that God would never allow His children. the "Bride of Christ". to suffer such things. Therefore the rapture will intervene and spare all of us from "the bad stuff." Oh really? I too, allowed myself to believe that for many years because I wanted to believe it. However, when I forced myself to take stock of what the Bible actually teaches. I quickly found that there are no such prophetic guarantees. As a matter of fact, church history is replete with stark contradictions to the "Pollyanna" attitude current within the ranks of the redeemed! From the day of Pentecost until the present, God. s elect have been persecuted and martyred by the multiplied millions. Our problem today (particularly in the U.S.) is that we have enjoyed 50 years of unprecedented prosperity throughout most of the industrialized world and I am afraid that this extended period of "good times" has blinded most of us to reality. Christianity stands alone among the religions of the world in that our Bible-based doctrines do not promise us anything tangible but persecution and suffering in this life. Yes, there are those today who are trying to preach a "health and wealth" gospel, but they are completely off-base in doing so. The scriptures they use for their erroneous message are almost always found in the Old Testament and concern promises made exclusively to the Jew. When a Christian tries to claim promises made to Israel, he is on very shaky ground! For instance, very few Christians today would be so biblically naive as to say that we have a claim upon any of the land God has promised Israel. Yet many turn right around and lay claim to the promises God made to Israel and the Jewish people concerning health and material prosperity. What. s the essential difference? I believe that a similar misunderstanding of Scripture is responsible for the current epidemic of "rapture-itis" among believers. We are told in 1 Thessalonians 5:9 that God has not "appointed us to wrath." All of the conservative commentaries tell us that the wrath referred to is His wrath. to be poured out upon the earth during the Tribulation Period. Therefore the "Bride of Christ". the Church. can supposedly confidently face the future with the knowledge that we will not have to go through that awful time. According to this scenario, the Lord will descend from heaven and will meet His Church in the air. in a moment, the twinkling of an eye. thereby sparing us from incurring His wrath . What a wonderful and comforting teaching this is! However, I hate to be the one to have to point it out, (thereby spoiling the "warm and fuzzies") but what about the wrath of the devil? What about the wrath of man? Are we immune to them? Will the rapture serve as a "one size fits all" solution to the very obvious threats facing us in the near future? Of course the answer is "not necessarily!" Before the Lord removes His Church, we could easily be subjected to intense persecution and even death. This has actually been the norm throughout Church history, so why should we be any different? During the Calgary Prophetic Conference of November 27-28, Christian author Fritz Springmeier gave the perfect example of how "rapture-itis" can devastate the belief structure of individual Christians. By the time Mao Tse-tung established Communism in China, Fundamental Christian American and European missionaries had been active for over 100 years, establishing a vibrant national church of approximately 1 million baptized Chinese members. As Chairman Mao's forces continued to beat back the Nationalist Chinese forces, many of these Born Again Chinese began to become frightened over their fate. However, they were falsely reassured by the Christian missionaries that they need have no fear, for the Bible promised them that they would be Raptured out before they were delivered into the hands of the Communists! Of course, this rapturing of Chinese believers did not happen, and many of them suffered a loss of faith as a result. Unfortunately, many people today seem to blithely believe the same story as we face down the onslaught of the coming Antichrist. One does not have to have a doctorate in sociology to recognize that too many people today are exhibiting behavioral patterns reminiscent of pre-world war II days. The "Roaring Twenties" were not called that because of some audible phenomenon. People were pleasure-mad and "let it all hang out", largely due to the euphoria surrounding the end of WWI. Only the onset of a depression and another world war temporarily curbed their insatiable appetites and permanently cured them of the persistent (and ridiculous) belief that the world was getting better and better. However, with the passing of time, old lessons have been forgotten and new generations have swollen the ranks of the uninitiated. making certain that history will again repeat itself. And with that thought in mind, I predict that we are once again in the midst of another tragedy waiting to happen and the rapture may not save us. For many years students of prophecy have pondered 2 Thessalonians chapter two and attempted to determine some sort of "time line" based upon the information given there. Verse 2 mentions the "day of Christ". literally "the day of the Lord", which is another way of referring to the Tribulation Period. Verse 3 then tells us unequivocally that it (the day of the Lord) will not come until after other prerequisite events occur: (1) "A falling away" (KJV) takes place, and (2) the "man of sin" (antichrist) is revealed. Verse 8 then gives us additional insight because it tells us that the antichrist ("that Wicked") will not be revealed until after something else takes place. Just what that "something" is. the third prerequisite. has been and continues to be a source of puzzlement to me. In verse 7 we find the statement "& only he who now letteth (hinders) will let (hinder), until he be taken out of the way." (KJV) Since there is the double reference to "he", it is generally believed to refer to the Holy Spirit and I believe that this interpretation is correct. However, the consensus among current prophecy teachers is that "he", the Holy Spirit. His restraining influence. will leave along with Christians at the rapture and they feel this is proof positive that the rapture must occur prior to antichrist being revealed. But it is this particular belief, or interpretation, that I now feel to be highly questionable! Why would I say this? Turn back to 1 Thessalonians 5: 2-3 and we will see the general timing of the rapture. The apostle Paul has just been talking about the rapture in chapter 4, verses 13 through 18. He then continues in chapter 5 by telling them (the Thessalonian believers) that there was no need for him to write anything else to them on the subject, because they knew perfectly well that the Lord. s coming for His church would be like a "thief in the night". unexpectedly! But unexpectedly for whom? Certainly not the church because verses 4 and 5 make that clear. Members of the true Church will know, by the Signs of the Times, that the Rapture is very close. Who then will be caught off guard? Notice that verse 3 says, "For when they shall say Peace and Safety& " Who are the "they" who will be caught off guard? "They" are the unbelievers of this world who will be completely surprised by the rapture and the subsequent onset of the Tribulation Period. [Verse 2] "... you yourselves know perfectly well that the day of the Lord[.s return] will come [as unexpectedly and suddenly] as a thief in the night. [Verse 3] When people are saying, All is well and secure, and, There is peace and safety " (1 Thessalonians 5:2-3(a), Parallel Bible, KJV/Amplifed Bible Commentary, emphasis mine). The general timing for the rapture is when the people are saying "Peace and Safety," etc. Why would they be so anxious about finally having Peace and Safety? I am convinced that it will be due to their belief that the antichrist has solved the world's problems, beginning with the all-out war the world has just experienced ! Bear with me a bit while we use our imagination to see if we can construct a scenario that will fit this general set of circumstances. WHAT IF: (1) Y2K is far more serious than we have been led to believe. (2) The stock markets of the world crash and the economies of all the nations go under. (3) China invades Taiwan. (4) North Korea invades South Korea. (5) The United States is simultaneously attacked with nuclear weapons by Russia, China, and others. (6) Israel uses advanced weaponry to destroy the hostile nations surrounding her. (7) Possibly as a result of this action by Israel, Russia then attempts to invade her and is actually destroyed by God. (8) UFO. s and "aliens" suddenly appear throughout the world and make contact with what is left of the governments. (9) Then, from out of nowhere, a man appears on the scene. probably riding on a donkey, and enters Jerusalem, proclaiming he is Israel's long-awaited Messiah. He then begins to perform miracles, even calling fire down from heaven. and very quickly establishes his credentials (to the satisfaction of the orthodox Jews) as being their Messiah. More than likely he will claim complete credit for the destruction of the Russian forces, thereby saving Israel from annihilation. Within hours he will implement plans and policies which will restore order, re-establish ruined economies, and make an end to the hostilities raging around the planet. He will demonstrate overwhelming supernatural abilities and will so captivate the hearts and minds of those still living that they will gladly proclaim him as their king! As far-fetched as this scenario seems, it is entirely within the long-revealed plans of the demonically controlled "New Age" writers, plus it firmly corresponds with Bible prophecy! This "Lord Maitreya" (the antichrist) will work his magic and bring calm out of chaos. Should it then be any wonder that the people of the world will be excited and talking about "Peace and Safety"? It is now my belief that the rapture of the church will occur at some point concurrent with this brief period of euphoria on the part of the world's inhabitants, immediately after Antichrist arises. The "falling away" (KJV) mentioned earlier in the text from 2 Thessalonians 2:3 is "he apostasia" in the Greek and is literally "the apostasy." Most conservative commentaries see this as being a mass desertion of false "believers" from the midst of Christendom. I have always been intrigued by this view because I could not understand what would precipitate such an exodus, but the scenario I have just proposed would do the trick! Those who are not genuine in their profession of Christ will flock to the antichrist because of his exploits, and if this were not enough, God Himself will also "send them strong delusion" (2 Thess.2:11). This then brings us back to the third prerequisite mentioned earlier. something that must happen before the antichrist can be revealed -- that is, the mysterious restraining influence of the Holy Spirit against sin must be removed. Most of us (myself included) have always viewed this as being an event. something that will occur within a short time frame. such as the rapture itself. I no longer believe that because nothing that I am aware of in Scripture demands it! It occurs to me that it is entirely probable that we have been in this process for the entire length of the Church Age and certainly we see more evidence of it today. More than one pastor has made statements to the effect that it seems as if God is slowly removing His hand of restraint from this world! Surely each of us would have to agree that sinfulness is rampant today and getting worse by the minute, would we not? At some point in the very near future, the process could be complete and all restraint removed . "Hold on now," I can hear some of you saying, "What about the church? As long as we are here, the Holy Spirit will continue to restrain sin!" But to this assertion I must reply, "Where in the Word of God is a definitive statement to that effect found?" Please give me chapter and verse! This, my friend, is an inferred concept not directly supported by Scripture! What I mean by this is that there are no guarantees of extent or limit. Right? Our God is Sovereign and certainly can amplify, restrict, or withdraw entirely, the influence of His Holy Spirit as He chooses. The last time I checked, the Church is still here on earth and any born-again child of God should be able to see and understand that godliness itself is on the decrease among us. Therefore, is it so far-fetched to believe that God just might end His influence upon unbelievers, even while the Church is still here? The only "fly in the ointment" concerning my understanding of this sequence of events is found in the sentence structure of 2 Thessalonians 2:3, where the apostasy is said to come first and then the man of lawlessness (sin) revealed. (I believe the word "first" refers to the fact that these events must occur before the Tribulation Period itself can start). If this is meant to be sequential, the apostasy would come first and perhaps be independent of the actions of antichrist. If they are concurrent, (and I believe they are) the actions of the antichrist would definitely promote the final act of apostasy . the culmination of a process literally started on the day of Pentecost! So then, in view of what we have just discussed. do you still believe that the rapture is going to intervene and spare the Church from any and all suffering? If you do, I hope that you are right, but I strongly urge you to prepare yourself spiritually in case you are wrong! We at The Cutting Edge firmly believe that the Traditional Bible teachers have consistently been teaching error at this point of the time leading up to the appearance of Antichrist. Their Timeline shows a seamless, peaceful transition into the time of Antichrist's appearance. 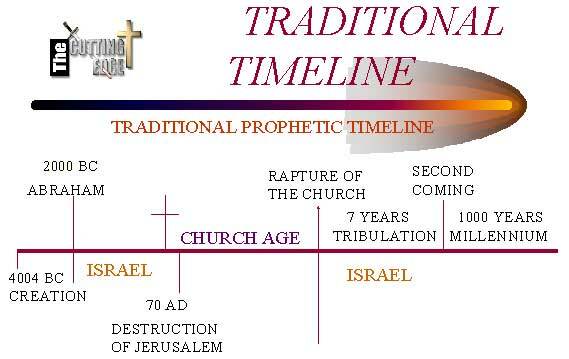 We see no trouble, no wars, no difficulty of any kind leading up to the beginning of the Tribulation Period; in fact, as you look at this Traditional Timeline, please note that no provision is even made for Antichrist's appearance on earth, assuming that his appearance actually begins the Tribulation Period. We know this cannot be true, because of Daniel 9:27. Before the Antichrist can confirm the covenant with Jewish spiritual and political leaders, he must convince them he is their Messiah. Because the "Jews require a sign" [1 Cor 1:22], the Antichrist plans to deliberately stage fulfillment of all the Messianic prophecies in the Old Testament and the Torah. This stage will take weeks, if not months. After each Messianic prophecy is falsely "fulfilled" by Antichrist, more and more Jews will become convinced, even the old-line skeptics among them. "[You should] be exceedingly glad on this account, though now for a little while you may be distressed by trials and suffer temptations, so that [the genuineness] of your faith may be tested, [your faith] which is infinitely more precious than the perishable gold which is tested and purified by fire. [This proving of your faith is intended] to redound to [your] praise and glory and honor when Jesus Christ, the Messiah, the Anointed One, is revealed" (Parallel Bible, KJV/Amplified Bible Commentary, emphasis mine). "[The purpose is] that through the church the complicated, many-sided wisdom of God in all its infinite variety and innumerable aspects might now be made known to the angelic rulers and authorities (principalities and powers) in the heavenly sphere " (Parallel Bible, KJV/Amplified Bible Commentary, emphasis mine). Putting the two texts together (1 Peter 1:6-7 and Ephesians 3:10), we can see that God tests us so that the genuineness of our faith is made manifest to the angels! In the Old Testament we find another example of this. that the testing of Job by the devil was allowed by God to prove his genuineness. As to why God deems it necessary to "prove" anything to angels (whom He created) is not at all clear to me, but the fact remains that He does. Therefore, to arbitrarily assume that the rapture will spare the Church from "all of the bad stuff" is wishful thinking and not realistic. My advice to the brethren is that we get on our knees before our Sovereign and Holy God and ask Him to prepare us for whatever is ahead, because I believe that we are going to face a trial by fire very soon. We believe the appearance of Antichrist will be preceded by enormous difficulties, including wars, economic collapse, pestilences, and many other terrors. Since Matthew 24 foretells the "birth" of Antichrist, we can assume his appearance will be immediately preceded by the very severe "birth pangs" [verse 8, 'sorrows' really means 'birth pangs'] of verses 6-8. Literally, out of the smoke, dust, and destruction of a Third World War in the Middle East, of two other wars, of an Arab oil embargo, Arab terrorism in our cities, Y2K, unparalleled natural disasters, and rioting in our cities so bad foreign troops will be called in, Antichrist will stride onto the world stage. Because his agents were causing all these disasters in the first place, they can immediately end them, in such a way as to give glory to Antichrist. Literally, after all these disasters, the peoples of the world will be saying, "Finally, we have God on Earth. Finally, he will personally use his omnipotent power and ageless wisdom to bring "peace on earth, and safety among men". This is the first time people are likely to be saying "Peace and Safety", and this statement on their lips may precipitate the Rapture of the Church. 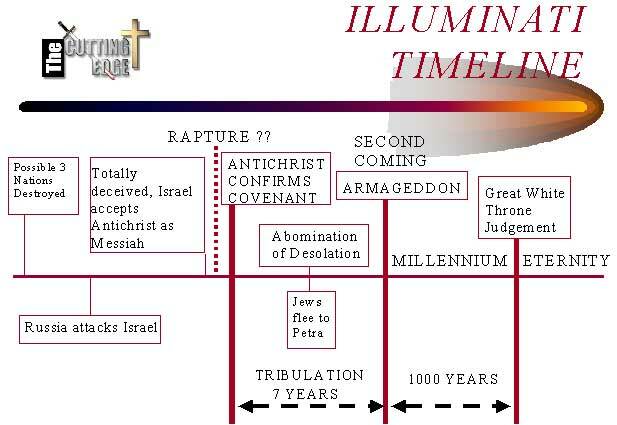 We believe this Timeline makes more sense given both Scripture and the Plans of the New World Order. If we are to see the appearance of Antichrist, we must prepare ourselves to go through the terrible frights and dangers of these planned wars and miscellaneous disasters, being strong witnesses for God rather than losing our faith because we misunderstood clear teaching of Scripture. "And some of those who are wise, prudent, and understanding, shall be weakened and fall, [thus, then], the insincere among the people will lose courage and become deserters. It will be a test, to refine, to purify, and to make those among among [God's people] white, even to the time of the end ..." [Daniel 11:35; both Scriptures taken from the Parallel Bible, KJV/Amplified Bible Commentary].